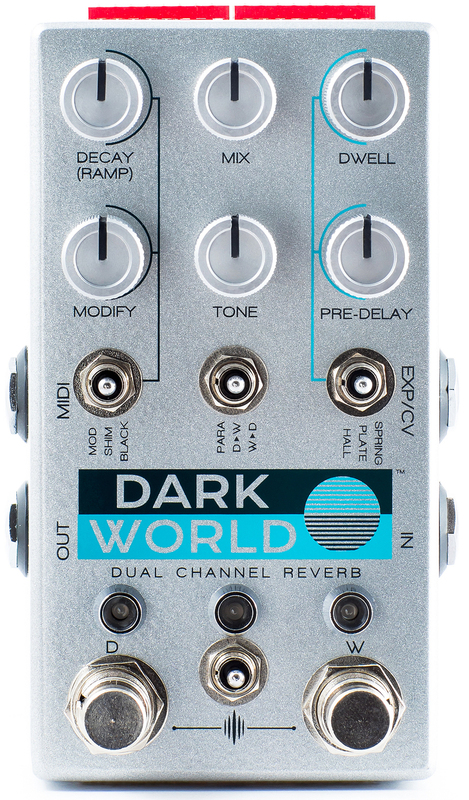 CHASE BLISS AUDIO – DARK WORLD DUAL CHANNEL REVERB 正式釋出! 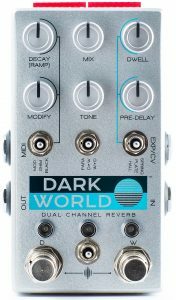 Chase Bliss Audio 於2018年最重要、也是該品牌銷售速度最快的單顆 “Dark World” Dual Channel Reverb 正式發布， “Dark”、”World” 兩個截然不同特色的Channel 分別由 Cooper fx 、 Keeley Electronics 設計 ，”Dark” 三種模式 MOD/SHIM/BLACK ，”World” 三種模式 HALL/PLATE/SPRING，兩個Channel 可以做平行、D>W、W>D 三種模式運作，共有33個不同的 routing 方式，加上其他參數控制和MIDI Expression Control，有太多太多值得玩味的效果組合， “Dark World” 是一顆非常有趣、強大而且操作友善的 Reverb! DARKGLASS MICROTUBES X / MICROTUBES X7 新世代Multiband Distortion到貨! !